Today’s orchid is the third Pleurothallis in a row – what a fantastic genus. 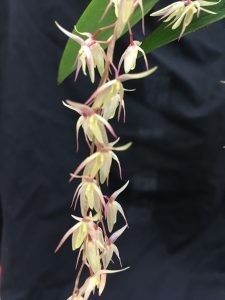 This species produces really pretty flowers in long pendulous spikes and gives a great display. 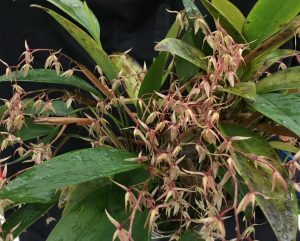 Pleurothallis loranthophylla is native to wet forests from sea level right up to 2100m and is found from Costa Rica through to South America and as far south as Peru. It produces more roots than many of our Pleurothallis species making it more tolerant of heat and dry periods than many. The flowers are produced from a dry sheath that forms in the axel of the new leaf but be patient as plants will sit ready to flower for months and then produce a mass of flower when conditions are just right (usually in the autumn for us). Beautiful and unusual as Pleuros go. Keep up the good work by the way.